It’s the big one: the Mining Complex Blitz Event begins today! This Event is open to all Combine Members. It presents the unique opportunity to seize control of Mining Complexes held by rival Combines, and to remap your own Combine’s borders without the risk of weakening your army long-term! During the event, Combines will need to engage hostilities at Mining Complexes. The more enemy Units you can destroy, the better your Combine will perform! As soon as the Event ends, you will be able to restore 90% of the Units you lost in the Mining Complex Blitz for FREE! If you can't wait until the Event’s completion, those 90% can also be restored with Diamonds while the Event is still running. 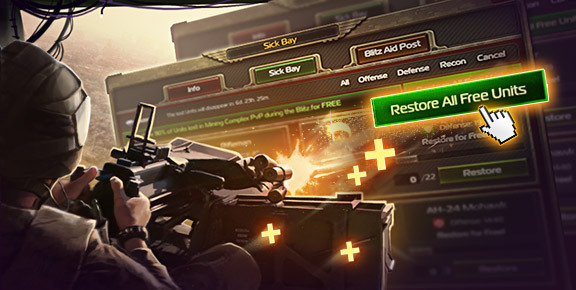 The rest of your fallen warriors can be restored in the Sick Bay as usual. Please note that only those Units lost while fighting other Commanders can be restored for free. 1. Any ZHG forces you eliminate at Mining Complexes will not count towards your Units Destroyed Tally, and will not affect your position in the Rankings. 2. Any Units lost as part of a Combine Attack must be restored at the Sick Bays of their home Bases. Make sure that all participating Combine Members are aware of this before an Attack is launched. 3. Certain Combine Achievements will be impossible to earn while the Mining Complex Blitz is ongoing. 4. Units destroyed and Mining Complexes captured and downgraded during the Event will not count towards Combine Challenge or War scores! 5. AvP Units cannot be revived and thus the Blitz mechanics do not apply to them. This is a fast-paced Event that will only run for a short period of time – and it begins today! Get moving – and prepare your armies for all-out war!